The first time I had this beer was at my fiancee's family Christmas gathering last year. One of her uncles brought a variety pack of adult beverages to share, and there were a lot of beers in it that I'd never tried. After debating between a few, Pipeline Porter won out. I grabbed one from the cooler, headed back to the den, sat down, and popped the cap. I was immediately smitten. Since that first taste, I've been on the hunt for the beer. I spent all year looking for it but never once saw it. For some time, I actually thought I'd made it up. I found other Kona brews in stores (I once bought some Longboad Lager, thinking that was the beer I had) but that mystical Christmas beer always eluded me. Until recently, that is, when Kona posted on Facebook that Pipeline was headed back to stores. I ran out and bought some, and here I am today. Kona Brewing Co. was founded by a father in son team, who started selling their beer in 1995. What started with two meager brews shortly grew into ten regularly-crafted beverages. The company is based out of Hawaii's Big Island, but has a smattering of breweries scattered around the continental US. They distribute their brews across Hawaii, the majority of mainland states, and total of nine countries. The company believes in sustainability and recycles as much of their waste as they can. 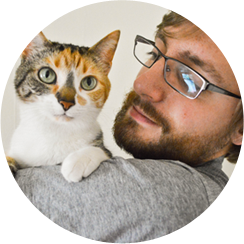 Read more about Kona at its About Us page. 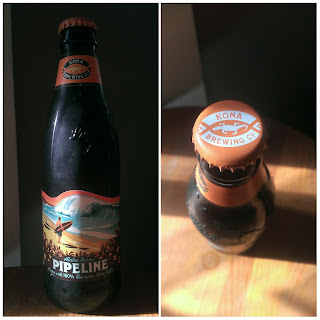 Unfortunately, Pipeline Porter doesn't have its own page on Kona's website. Instead, information on the brew can be found on the brewery's "Draft Only Beers" page (I don't know why its there since it is very obviously not a draft-only beer. I can only guess that the website hasn't been updated in a while). Regardless of where I can find info on the brew, the important thing is that Kona provides it. And, there's a lot of details to be had: on the page, I find the beer's ABV (5.3%), the malts and hops that went into making it, it's IBU and gravity (two things that don't concern my purposes for this blog), and a description of the brew. The description says the porter is brewed with Hawaiian-grown coffee and has "... a distinctive roasty aroma..." with an earthiness in its flavor. True to the website's claim, Pipeline's aroma is roasty. And coffee-y. Which most likely comes from the use of actual coffee in the brew. The scent of this stuff is almost intoxicating in itself. Without hyperbole, this is one of the nicest smelling brews to ever grace my nose. Like the great cat she is, Purrl agrees! 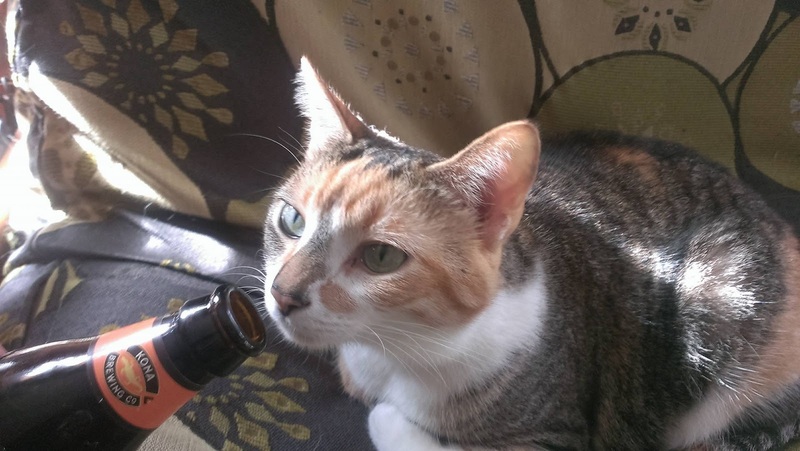 At a whopping ten whiffs of the beer, I didn't think she wanted to give it up. The flavor lives up to the reputation given to it by the aroma. It's coffee everywhere, with the dark chocolate roastiness that is found in every porter worth its salt. There's also a kick of bitterness in the aftertaste thanks to the hops Kona uses. The taste of pipeline exudes excellence. A mild fizz can be found in the brew, but not much--this is a porter, which is a kind of beer that is traditionally dark and heavy. Due to this, anything more than slight carbonation is too much. My memory for this beer isn't Hawaiian, so my apologies go to Kona Brewing. It is, however, tropical and involves a beach. Once, during a vacation, I found myself on a beach in Costa Maya, Mexico. I had previously gone to a bar a purchased a Dos Equis, thereby starting my years-long love affair with that brew, before wandering onto the sand. I laid out in a chair, put on my headphones (blaring Conor Oberst's 2008 eponymous album), and nursed the beer until I eventually dozed off. It was, hands down, one of the most relaxing moments of my life. Pipeline Porter delivers that experience in the bottle I'm drinking. Even here, in my loud, cold Cincinnati apartment, I can take a swig of the porter, close my eyes, and find myself on a secluded beach. I won't lie to you; this beer is fantastic. It is one of the best porters I have every had. Kona Brewing Co.'s Pipeline Porter wins an immensely admirable 9.5/10 from me. Should you happen to see it on your beer store's shelves, purchase it. You won't even need to thank me for the suggestion.